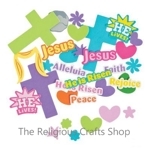 50 Easter Foam Self Adhesive Shapes. These foam shapes are a useful essential in Sunday Schools. Ideal for collage and picture making. Easy to use - simply peel and stick. Crosses measure 11cm by 7.5cm. Smaller flower and heart shapes measure 2-4cm. Verses measure 4-9cm. Harvest Inspirational Activity Book. A great way to celebrate Autumn and Harvest. Each book has 12 printed pages of activities which will keep kids entertained. Book measures 18cm by 13cm. 1 sheet of 48 Bugs and Insects Foam Shapes. These cute little bugs are bound to be popular with little children. 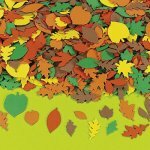 They are ideal for activities linked to nature and our world, and can be matched with our self adhesive foam leaves and flowers. Easy to use - simply peel and stick. Foam shapes measure approximately 1cm to 3cm. Foam sheet measures 23cm by 30cm. Sheets come in colours - blue, yellow, purple, green, red and pink. A random colour selection will be sent unless there is a specific request. 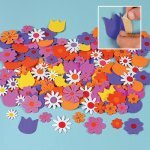 50 Fabulous Foam Self-Adhesive Daisy Flower Shapes. Our colourful variety of flower shapes keep kids going all school year long! 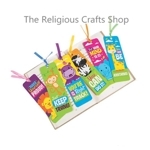 Ideal for Sunday Schools - keep a supply for a wide range of crafts throughout the year. These self-adhesive shapes have an easy-to-use peel off backing and stick to most surfaces. Use these flower shapes to decorate notebooks, crafts, frames, posters�the possibilities are endless! Flowers measure approximately 25mm to 50mm. 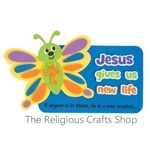 12 Pack of Good News Butterfly Magnet Crafts. 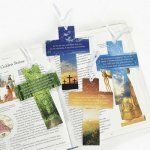 These crafts are perfect for Sunday Schools. 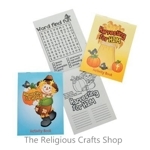 Each craft is individually packaged with all you need - instructions and self adhesive foam shapes. Finished craft measures 12cm by 9cm. 12 Pack of Funky Frog Tattoos. Each pack contains a variety of fun designs and are a perfect match with the Funky Frog Sticker Selection. These tattoos are always popular with teenagers. Easy to apply and remove. 12 Pack of Beautiful Butterfly Tattoos. A variety of butterfly designs in each pack - these tattoos are a best seller and popular with girls. Easy to apply and remove. 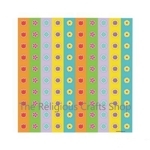 Colourful Flowers Stickers. 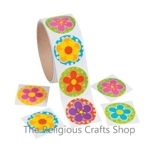 These colourful stickers with simple bold flower designs are bound to appeal to younger children. Stickers measure approximately 4cm. 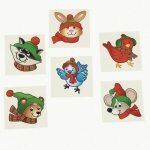 Pack of 50 Inspirational Nature Stickers. 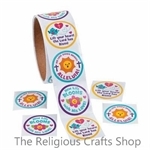 These are great stickers to reward and treat children in Sunday School. Stickers have a range of quotations and illustrations. Stickers measure 4cm. 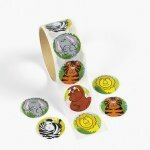 Pack of 50 Jungle Animal Stickers. 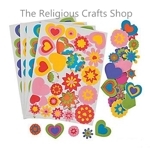 Children love to wear stickers and use them to decorate their pictures and cards. These stickers relate to animals in the wild and the natural world. 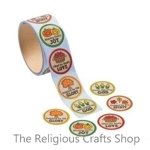 Each sticker measure approximately 4cm.